Doctor Leonard McCoy was born in Georgia, USA, Earth, in 2227. He was the son of David McCoy. McCoy was attending the University of Mississippi during the mid-2240s when he met the joined Trill Emony Dax, who was visiting Earth to judge a gymnastics competition. While Jadzia Dax did not go into detail regarding the exact nature of their relationship, much may be inferred from her statement that "he had the hands of a surgeon." McCoy began studying medicine in or before 2245. While in medical school, McCoy and his friends used to play practical jokes on each other all the time. For example, they would substitute real drinking glasses with trick drinking glasses, causing the target drinker to spill on their shirt. In 2251, McCoy led a massive inoculation program on planet Dramia II, where he saved a Dramen colonist, named Kol-Tai, from a strain of the Saurian virus. Shortly after McCoy departed, a plague struck Dramia II, killing most of the colonists. In 2253, McCoy developed a surgical procedure for the humanoid brain; grafting neural tissue to the cerebral cortex, followed by the creation of an axonal pathway between the tissue graft and the basal ganglia. In 2266, Lieutenant Commander McCoy was a sciences division officer. He was stationed on Capella IV where Capellan lack of interest in medical aid or hospitals ensured a short visit, lasting only a few months, before eventually joining the USS Enterprise's five-year mission. The knowledge of Capellan customs he acquired on this mission would prove valuable. 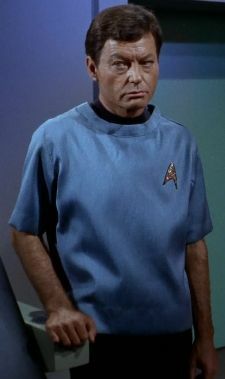 In 2266, McCoy was the Life Sciences department head and the chief medical officer of the Enterprise. His assigned quarters were "3F 127" on Deck 9, section 2. His predecessor was Doctor Mark Piper. Kirk liberally used the nickname "Bones" for his doctor from this point on. McCoy provided Kirk with advice when the Enterprise's transporter duplicated him in 2266. Kirk was split into two people – one good and one bad. Kirk needed his evil side to live as well as to command the Enterprise. McCoy told his captain that all Humans have their darker side, it is literally half of what they are and they need it to live. Later, Kirk had the choice of going through the transporter again to reintegrate back into one being. The procedure was dangerous and McCoy told him "Jim, you can't risk your life on a theory!" However, McCoy decided that the decision was Kirk's alone after he refused to relinquish command. Later, Kirk was successful reintegrated as one being. On stardate 1513.1, while conducting a routine medical examination of outpost personnel at the archaeological dig on planet M-113, McCoy became reacquainted with an old flame, Nancy Crater. Unbeknownst to McCoy, what became known as the "M-113 creature" had murdered and replaced Nancy years before. The last survivor of M-113's long-dead civilization was a telepathic shapeshifter who digested the salt content from its prey. Drawing from a potential food source's mental imagery, it appeared as sympathetic or attractive, and further hypnotized its victim before feeding; hence McCoy saw a vision of Nancy exactly as he had known her years earlier. When the creature began taking the lives of Enterprise crew members on the surface and aboard the ship itself, McCoy's past feelings for Nancy had tainted his judgment. It was only when Spock was assaulted and Captain Kirk's life was in imminent jeopardy that Doctor McCoy saw past the illusion of Nancy, forcing him to fire a phaser at a sentient being, the last of its kind. Just before firing, he said quietly, "Lord forgive me." In early 2267 the Enterprise visited the Shore Leave Planet located in the Omicron Delta region. During the initial survey, McCoy reported seeing a giant white rabbit followed by a little girl. Further investigation revealed that a vast underground factory recorded their thoughts and brought them to life. While walking through the glade with Yeoman Tonia Barrows, they discovered the dress of a princess, conceived from the thoughts of Barrows. McCoy encouraged Barrows to try on the dress, and afterward begin to romance the yeoman, later stating that she should not be afraid "with a brave knight to protect her." Moments later a Black Knight appeared on horseback, bearing a lance. Convinced it was illusion and could not harm him, McCoy stood his ground against a charge – impaled in the chest, he died instantly. McCoy was brought underground, healed, and returned to the surface with two cabaret chorus girls he once met on Rigel II. Barrow's obvious jealousy prompted McCoy to extricate himself from his fantasy girls, taking the yeoman's arm instead. On stardate 2713.5, the Enterprise discovered an Earth-like planet inhabited only by children. They soon discovered that all of the adults had died from a virus that caused the victim to age rapidly. The landing party contracted the disease and only had one week to live. McCoy and Spock developed a cure, but were unable to verify the formula with the Enterprise's computers, because the children stole their communicators. Desperate, McCoy decided to test the serum on himself when Spock stepped out. Spock and Kirk returned to find an unconscious McCoy, but also, that the serum worked. On stardate 3141, McCoy accompanied Captain Kirk, Scott, and historian Marla McGivers to the SS Botany Bay, where the landing party encountered Khan Noonien Singh in stasis. McCoy had Khan removed from his enclosure when it began to malfunction while waking him and caused Khan to have a heart flutter. McCoy later stabilized Khan and brought him back to health aboard the Enterprise. Khan awoke shortly thereafter in sickbay and threatened McCoy with a scalpel when the doctor came to check up on him. Khan removed the scalpel from McCoy's neck when the doctor told him to cut his carotid artery, remarking "I like a brave man." Later on, Khan commandeered the Enterprise and forced McCoy and several other Enterprise crewmembers to watch as Kirk was put into a decompression chamber to die slowly. Khan asked the crew to join him and his brethren but McCoy and the crew refused and were later knocked out by anesthesia gas sent out by Kirk and Spock, intending to knock out Khan and his followers. After the defeat of Khan and his augments, McCoy, in dress uniform, attended Khan and McGivers' sentencing. McCoy expressed incredulity when Kirk announced that he was dropping all charges in exchange for marooning Khan, his followers, and McGivers, on Ceti Alpha V. On stardate 3417, McCoy's tonsils, which had been removed some years earlier, re-grew when he was briefly under the influence of the Omicron spores. He mentioned that he had broken three ribs once. Although he took part in the subsequent mutiny, he returned with the rest of the crew after the spore's influence was eradicated. During an investigation of temporal disturbances over an ancient planet, McCoy accidentally injected himself with an overdose of cordrazine, resulting in psychosis and paranoid delusions and he escaped to the planet's surface. Kirk, Spock, and a landing party followed him into the ruins of an ancient civilization, where they discovered the Guardian of Forever, an ancient time portal device. Still psychotic, McCoy entered the device, transporting himself into Earth's past, and somehow created a history without a Federation or the Enterprise. Kirk and Spock, stranded and alone on the planet's surface, had no choice but to follow McCoy into the portal to try to undo whatever he had done to change the course of history. They found themselves back in 1930 New York, where they met social worker Edith Keeler but had trouble locating McCoy. Using an improvised tricorder device, Spock determined that Keeler's death was the focal point of the altered timeline – she died in the original history, but somehow McCoy's going back in time prevented this from happening. Eventually, Kirk and Spock spotted McCoy walking down a city sidewalk. McCoy was happy to see them, but then he noticed that Keeler was crossing the street nearby in front of a speeding car. McCoy tried to rush forward to save her life, but Kirk, realizing that this was the critical moment, tearfully grabbed his friend and prevented him from intervening, allowing Keeler to die and restoring their own historical timeline. After the first discovery of a silicon-based lifeform on Janus VI, the Horta matriarch, McCoy was the first xenophysician to actually treat one of the creatures, healing the wounded mother with a bandage of thermal concrete. "By golly, Jim, I'm beginning to think I can cure a rainy day!" He was also the first to describe the deadly habits and help find the cure for the flying neural parasites, a plague of one-celled flying creatures linked in a collective mind that had been sweeping across whole star systems and destroying all humanoid life. On a return to Capella IV, McCoy helped lead Kirk through tentative negotiations over dilithium mining rights with the Capellan Teer, talks which fell apart from Klingon interference. After the death of the Teer, the Enterprise landing party fled with the Teer's pregnant wife, Eleen. McCoy's truculent patient required an atypical bedside manner (i.e. "a right cross"), but he delivered the newborn High Teer, the rightful leader of the Capellan tribes. Eleen, having grown fond of McCoy, named the child Leonard James Akaar, much to Spock's annoyance, who commented that the name would cause Kirk and McCoy to become insufferably pleased with themselves for at least a month. During the encounter with the planet killer McCoy along with the entire Enterprise crew was thrust into the future and a different quantum reality. Forced to adapt to the year 2379 was difficult for McCoy especially since the Enterprise was so outdated it did not get any critical missions anymore. When Jim was offered command of the Enterprise-E later that year McCoy agreed to accompany him to the Enterprise-E instead of being forced to babysit cadets on the Constitution class Enterprise.